A favourite episode from the 1980s with the Private Detective duo dreaming of a 1940s murder most foul. This episode of Moonlighting (1985-89) boasts a prologue from a celebrity fan of this show, with the final screen performance from Orson Welles. This actor passed away a few days before his scenes were shown on television and this episode of this series dedicated to him. Moonlighting‘s opening theme tune written and performed by Al Jarreau. The series telling of a bankrupt model, Maddie Hayes who runs the Blue Moon Detective agency. She’s an icy blonde who meets her match in her wise cracking work partner, David Addison (Bruce Willis). The pair solving cases in (normally) weekly stand alone episodes. The show’s supporting cast included the agency’s quirky secretary, Agnes (Allyce Beasley). Later in the show’s run, Agnes’ love interest was introduced in the form of the agency’s trainee Private Detective Herbert Viola (Curtis Armstrong). Guest stars of the show included Jeremy Irons, Eva Marie Saint, Nicholas Pryor, Brad Dourif and Judd Nelson. This late 1980s drama-romantic comedy series had one of the best examples of on-screen sexual tension . With this show’s simmering pot of attraction between the two leads, Maddie and David. Many believe once the pair finally succumbed to their inner desires, the series lost its lustre. However the show jumped the shark for me, with an unfortunate dream sequence from Maddie’s unborn baby (the storyline written in due to Shepherd’s real life pregnancy). This with Bruce Willis cast as the baby, complete with nappy. (This in one of those you can’t unsee screen moments). Remington Steele (1982-87), a TV series which was reportedly the inspiration for Moonlighting. With the show’s star Pierce Brosnan also popping in as his television character from this show. David and Maddie’s characters were inspired when the show’s creator, Glenn Gordon Caron watched a performance of The Taming of the Shrew. With an homage to this Shakespeare play in another much-loved episode Atomic Shakespeare. Moonlighting had other references to other television greats of the time. These including Hart to Hart (1979-84) with an appearance from Lionel Stander. Stander playing his Hart to Hart character, Max. The episode starts with a heated discussion with Maddie and David on whether they should investigate a spouse’s infidelity. With both taking opposing views on this subject. She’s against it, he’s for it. The pair employed to find photographic evidence from a concerned husband on his wife’s faithfulness. On visiting him as he hopes to purchase at a run down 1940s nightclub, the client’s worst fears are confirmed. With him finding out his wife has not been unfaithful, the sale of this nightclub falls through. The owner of the nightclub, then tells Maddie and David of the Flamingo Cove murder that took place there. With the married clarinet player murdered by either Rita, his wife – a singer at the club – or her lover, Zach, the coronet player. Rita and Zach were both sent to the electric chair after reporting their lover, the murderer. Maddie and David both taking opposing views of the events relating to the murder. Maddie believes Rita as the innocent party framed by her lover who callously carried out the murder. David also believes Zach did it but as persuaded to carry it out by the now vampish wife. Afight on their contrasting views spills over to their ride home. With her calling him a sexist – and vice versa – as their fight continues after they return to the office. With a battle of the sexes chemistry reminiscent of Barbara Novak and Catcher Block in Down with Love (2003). The latter pair in that more recent 1960 homage to Doris Day and Rock Hudson, its apparent Maddie more bothered about this bickering than David. With their bickering shown in split screens in a nice wee in-series nod to this movie pairing. Later, the pair both dream of the events surrounding the murder. With them dreaming of this event, the show turns to black and white. With both Maddie and David casting themselves as the wife and her lover in both their dreams. The dreams showing their opposing views of the events. With those all too familiar tropes, their wardrobe, appearance and sets are reminiscent of those Film Noir 1940s movies. And both are wonderful homages the different films, actors and plots within these genres, With Maddie, she’s the innocent party. Where Rita, her character is seduced by the cornet player. With her guilt and upset regarding her husband’s murder as she’s framed by her lover. David narrates Zach’s side of the story in the first person, the spoken vernacular heard in those movies used, the wife more instrumental in the killing. With him going to the electric chair. As her character Shepherd performs two different songs, Blue Moon and I told ya, I love ya now get out! . Both the lyrics and her performance complementing the individual dreams. The title alluding to the film, with similar premise of a matricide The Postman Always Rings Twice (1981). And its an original episode, with both the colour and black and white scenes immediately transporting you from present day to the past and vice versa. It was a lovely revisit to this series which I remember enjoying back then. With this episode easily showcasing the star’s talents with the two versions of the story mirroring their present day characters. Shepherd showing a wonderful vocal performance in both dreams. With Willis in his version of the tale easily showing his charismatic characters irreverent and impish humour. However in both the present and past, the leads romantic on-screen chemistry is apparent in full force. With them sharing screen kisses, it’s kind of inevitable the pair would get together. But this concluded, back in the present day. a memorable episode for more reasons than one. So chances are, you’ll love this episode as a Die Hard Bruce Willis fan and one where he and Cybill Shepherd gained a flock of admirers. Spelling out their battle of the sexes banter at it best, both in black and white (and colour) as a will they wont they dream pairing. 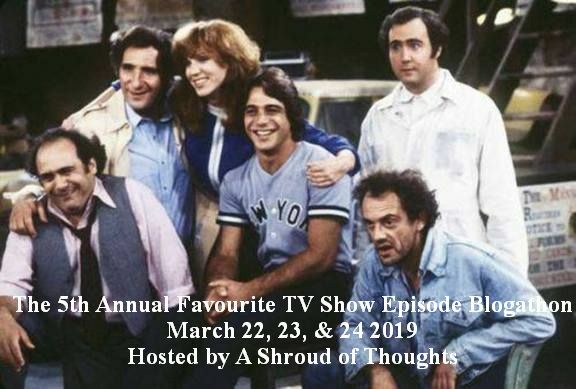 This review was added to Shroud of Thoughts 5th Annual Favourite TV Episode blogathon. Other reviews with this cast include Bruce Willis in Hollywood Hitmakers from the 1980s, Die Hard and 80s Crushes. Cybill Shepard in Chances Are and Fantasy island. This show’s guest stars reviewed here include Eva Marie Saint starred in North by Northwest and The Love Boat. Nicholas Pryor in Omen II, Murder She Wrote, The Colbys, Knight Rider, Dynasty, Dallas and Less Than Zero. Brad Dourif and Sydney Lassick in One Flew Over The Cuckoos Nest. Judd Nelson in St Elmos Fire. Pierce Brosnan in Mars Attacks, Mamma Mia and Mamma Mia: Here We Go Again. Lionel Stander in Hart to Hart and The Cassandra Crossing. A few years ago, I wrote about this episode for this very same blogathon – and also about the episode when Viola has dreams involving The Sheik in Casablanca. I loved watching Moonlighting when the reruns were airing a few years ago. Great post. It’s a fabulous episode isn’t it, will have to check out the Casablanca one too, it sounds great. Love to hear your thoughts on it when you do. Can’t wait, always love your reviews. This is probably my all time favourite episode of Moonlighting. Even then I was a huge fan of classic film, so it was fun seeing the show do a tribute to classic movies. Thank you for taking part in the blogathon! Thanks, it is a fabulous episode. Really enjoy this blogathon, revisited some great TV. over the years Thanks for having me. I’ve only seen a couple eps of Moonlighting, but they were very fun! This ep sounds a bit like the Castle ep “The Blue Butterfly,” which has similar nods to noir. Love to hear your thoughts on this one if you see it. And will certainly check out that episode sounds interesting. Thanks. I’m always impressed when a series steps outside of their usual routine and gives us something special. This is one of the most special and memorable from classic TV, and a terrific article. Thanks, do check out their Atomic Shakespeare episode too if you haven’t seen it already. Its a classic.